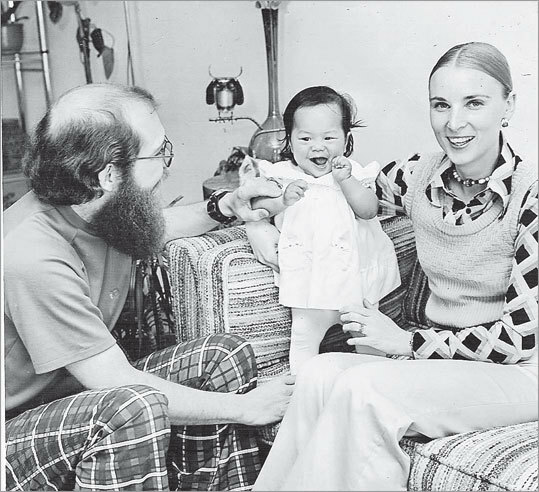 Author Mei-Ling Hopgood with her parents. She was adopted from Souther Taiwan in 1974. The woman, I know, was just trying to be loving. She was a bubbly Midwestern mom who had adopted two Korean daughters and went to great lengths to “keep” her daughters’ culture. Her girls took language lessons, and the family celebrated Lunar New Year - they never missed it. To help sensitize her daughters’ white classmates, each year this woman went into her daughters’ school and did a presentation on Korea, pointing out the country on a map, explaining its traditions, and showing the children a real hanbok, a traditional Korean dress. She told me this, and I nodded and smiled, trying to listen politely to her story. But something about what she was doing made me uncomfortable, despite her good intentions. Like her daughters, I’m an adoptee born in Asia; I was born in Taiwan and raised by a white family in Michigan. I thought to myself: Korean-Americans do not walk around in hanboks all day, and this child had never really done that either - unless her mother made her. When I was her daughter’s age, I wanted desperately to avoid the kind of identity that she was trying to give her child. I averted my gaze if an Asian-looking stranger threatened to look me in the eye. I didn’t want people to think I was one of them, because really, I wasn’t: I couldn’t speak Mandarin, Cantonese, or any other Chinese dialect, and didn’t do “Chinese” things in my home. My parents weren’t even Asian. I was trying so hard to show that I was just as American as anyone else. If my own mother had done something like that woman did, I would’ve hidden beneath my desk. Over the last two decades, international adoptions have become commonplace in the United States. More than 268,000 children have been adopted from abroad since 1991, with China, Korea, and Guatemala topping the list of countries they have come from over the last five years. At the same time, there has been a huge push to import adoptees’ culture with them, a dramatic shift from a time when parents were told that assimilation was best. Today, almost all parents who adopt internationally try to cultivate some kind of connection to their child’s birth land. Efforts range from throwing some ramen noodles in a salad to remodeling the interior of their homes to an Asian motif and spending thousands of dollars to send their children to language schools and heritage camps on another continent. Parents do these things hoping to help their children adjust to the sometimes tricky duality of their existence. Yet I worry that some parents are now taking things too far: Going to extremes to idealize the native culture might be as damaging to an adoptee as ignoring it. Asian-American activists have for decades fought the idea that you are born with a culture - that if you look Asian, you must eat with chopsticks, wear different clothing, speak a different language; that you are different and thereby less American. Parents, to some extent, are asking children to conform to those expectations. And without adequate acknowledgement of the reality that actually is - their experience in America - I suspect that children might have an even harder time figuring out where they belong. As many adoptees started to enter adulthood, especially during 1980s and 1990s, the adoption community began to see the profound flaws in the love-is-color-blind philosophy. Grown adoptees - many of them Korean born - began to speak out about their feelings of self-loathing, racial taunting, and feeling like they had lost or been denied their birth culture. Those cautionary tales sent the pendulum swinging the other way. Adoption advocates at all levels, from social workers to the ministries of foreign governments, now consider preserving the child’s heritage to be vital. Countries such as China even require that some element of their culture be maintained in adoptive homes. Eager to do the right thing, many adoptive parents - usually white and middle-to-upper-middle class - have tried to re-create their children’s native cultures. Moms and dads formed and joined support groups, enrolled their children (and themselves) in language, dance, and art classes. They decorated their homes with Russian paintings, threw Lunar New Year parties, bought Guatemalan jewelry, and made regular pilgrimages to the local Chinatown. They established their own specialty magazines, attended culture camps in the United States, and spent more than $10,000 on “heritage tours” in the Motherland. An entire industry - from travel agencies to doll makers - caters to these families’ desires to provide adequate cultural touchstones. Sociologist Heather Jacobson told me the romanticization of culture is common among the adoptive families she interviewed for her book, “Culture Keeping: White Mothers, International Adoption, and the Negotiation of Family Difference.” Jacobson said mothers with children from China told her they felt a deep connection with the country of China, its traditions, and people. Yet, she also noted, “it did not translate into actual friendships or deep meaningful day-to-day relationships with Chinese people here in the United States.” Most of the women she spoke to wanted their children to have more contact with immigrant Chinese - rather than, say, third-generation Chinese-Americans - because they were more genuinely “Chinese.” The traditional culture - fan dances, tea ceremonies, and holidays - is more accessible, more alluring, than the actual, complicated experience of being Asian American. “It’s the parents who enjoy it so much - and that’s largely how Asian cultures are understood and experienced in the US,” she said. “So often families are more comfortable talking about culture because culture is something that we can celebrate, and food, music, and other fun things can be associated with culture,” said Amanda Baden, who was adopted from Hong Kong, and is now a Manhattan psychologist who advises adoptive families. Being open to talking about race is just as important, she said. I was Miss Everything in high school, from class president to pompom captain. Looking back now, part of that was probably an effort to prove to everyone - but mostly myself - that I was as American as anyone else. This was a discussion that I didn’t have with my parents, though, as open as they were. I didn’t want to worry them, knowing how hard they had tried to impress how wonderful we were. I didn’t know how, nor did I want, to tell them about my feelings of isolation until much later, when I could understand them myself. It wasn’t until I met my birth family, at age 23, that I actually started trying to “be Chinese.” They were nothing like the poor, farming family I had imagined them to be; my father had clawed his way out of poverty and into the middle class. 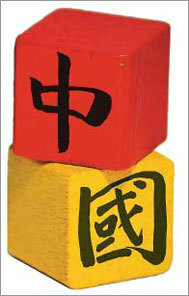 In fact, their own culture had evolved into a wild mix of traditional Chinese values and modern influences. Taiwan similarly challenged my assumptions, with its Buddhist temples juxtaposed against spanking new skyscrapers. After spending a good portion of my life ignoring my heritage, I started to study Mandarin, and even took a year off of work to immerse myself in Chinese language, culture, and history. I adopted the styles of my sisters - their hairstyles, their fashion preferences. I learned to make dumplings and bought tea sets. Yet, my enthusiasm and best efforts only took me so far. Today, I might be able to make small talk with the Chinese owner of my local grocery store, but I can still barely have a one-on-one conversation with my birth parents. I’ve come to recognize that I will never know them in a deep, substantial way, and I will never fit perfectly back into the country where I was born. My return to Taiwan and meeting with my birth family were an important part of my own internal personal journey. But just as important have been the friendships I have built with other Asian-Americans: What I share with them is not a mythical culture, but an experience in America. Seeing others who defied cliche encouraged me to do the same - and to be proud of who I was. It can be tough to maneuver the multiracial dynamics inside, and outside, the confines of a family, but what I tell parents is: “Relax.” There is a healthy middle ground that I think my own family more or less found. My parents celebrated my heritage, and that of my brothers, who were adopted from Korea; and they also went out of their way to find Asian-American baby sitters and incorporate Asian-American adults into our social circles. It wasn’t easy. Mom and Dad, as uncomfortable as they may have been at times, learned to live with the differences in our racial perspectives, our rebellions, our journeys to Korea and Taiwan and back. They listened, let us vent or cry, and backed off when they needed to. Ultimately, they let my brothers and me decide how our past would influence our present. Today, I don’t wish that I were more Chinese, even if my biological family and our heritage hold a place in my heart and history. I’m glad that in college I chose to study Spanish in Mexico for a semester. Almost five years ago, my husband and I moved to Argentina, where we are living and raising our daughter. No regrets, either, at having to weather some racial nastiness here and there, and come out with a more confident, fought-out self-image. I appreciate that my parents were loving and patient enough to let me figure out these things at my own pace. I realize that adoptees will all come to their own view of culture and adoption, but I imagine many international adoptees and children in multiracial families share this wider, more global view of themselves. Our blended family backgrounds, beliefs, and practices - as diverse, complicated, and dissonant as they might seem - are as authentic as any. We are another version of the immigrant story, with a culture is just as rich as the one we might have had. Mei-Ling Hopgood is a journalist and author of “Lucky Girl,” a memoir about her reunion and relationship with the family in Taiwan who gave her up as a baby. Raised in Michigan, she now lives in Argentina with her husband and daughter. She can be contacted at info@mei-linghopgood.com.